The event itself. Image via https://www.facebook.com/events/1737937103136785/?active_tab=about. DePaul University was back at it again this past Tuesday. DePaul seems set on continuing to be “America’s worst school for free speech,” which explains why conservative commentator Ben Shapiro was threatened with arrest for even setting foot on campus. First, some background. Last year, an event with Milo Yiannopoulos descended into chaos after protesters shut it down. The Milo event occurred shortly after an email was sent to DePaul students that told them they were prohibited from engaging in partisan chalking on campus property. Shapiro himself was banned from speaking at DePaul earlier this year, due to security concerns. However, he was initially going to be featured as a special guest during philosopher Christina Hoff Sommers’s speech, entitled “Victims, Victims Everywhere: Trigger Warnings, Liberty, and the Academy.” This would have been too much, and it was announced that Shapiro would attend the event, but only as an audience member. Even this was too much, and he was told upon his arrival that if he simply sat in the audience that he would be arrested. This video helps to explain what happened next. Everyone in attendance knew that Shapiro would not be speaking, and the event started with Sommers giving her speech. Suddenly, her phone rang and it was none other than Shapiro FaceTiming her, and he told those in the audience to reassemble down the street at the Greenhouse Theater, since that location was no longer on campus, and Shapiro could therefore speak without fear of arrest. So what does all of this mean? 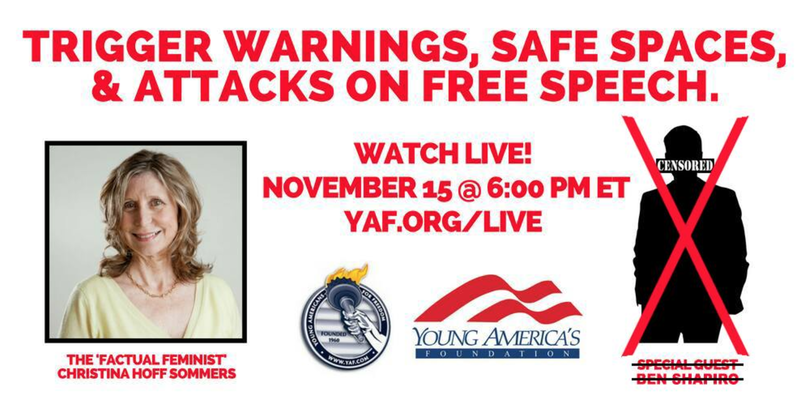 This is far from the first time that DePaul has tried to ban a conservative from speaking on campus, and it unfortunately will not be the last. Shapiro and Sommers both had their talks go on without any protests, and the new location was far too small to accommodate everyone interested in hearing them both talk. The original venue on campus would have been just fine, but because of DePaul’s actions, about half of the audience was not able to hear the speeches in person. While it is unclear if there ever was going to be a time for questions, Shapiro and Sommers were whisked away almost as soon as their talks ended, and the audience was rushed out because the Greenhouse Theater had a planned show to put on and had to clear all the attendees out to set up for it. They were under no obligation to host this talk and they did so anyway. Unlike DePaul, the Greenhouse Theater was at least doing its job on Tuesday night.